Inspired by the music and lifestyle of legendary musician Jimmy Buffett, Latitude Margaritaville is a new 55+ active adult community under construction in Daytona Beach, Florida. With innovative floor plans and abundant amenities, residents will relish the world-class options for recreation, nightlife, and dining at this up-and-coming community by renowned developer Minto. Active adults seeking homes for sale in Daytona Beach might find everything they are looking for—and more—at Latitude Margaritaville. Residents of Latitude Margaritaville will enjoy unmatched access to impressive amenities. Surrounding the Town Square, the epicenter of all activity in the community, residents will enjoy the state-of-the-art Fins Up! Fitness Center with a gym, aerobics studio, and an indoor lap pool and whirlpool spa. 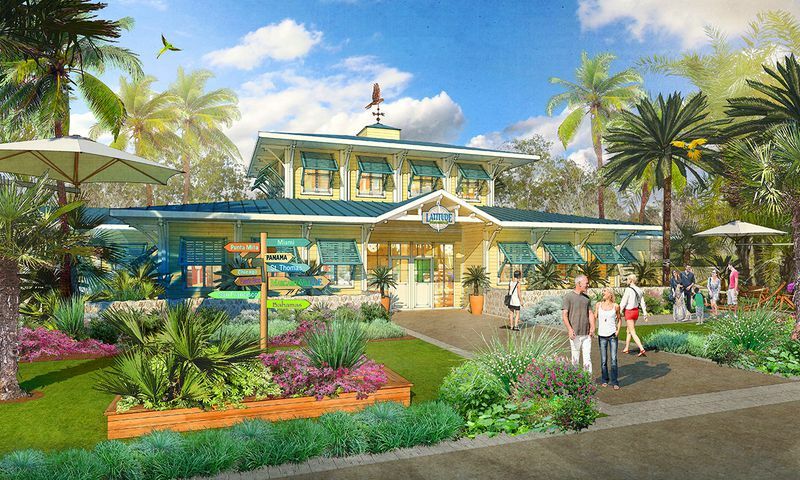 The Latitude Bar & Chill Restaurant will offer indoor and outdoor dining with Margaritaville-inspired menus and drinks. At the Last Mango Theater, residents will gather for performances, banquets, and dancing. The Workin’ ‘N’ Playin’ Center will include the Coconut Telegraph Business Center, the Barkaritaville Pet Spa, and multipurpose rooms for everything from crafts to cards. And with live music, entertainment, and dancing at the Town Square, active adults can live life like a song any day of the week. Just outside the Margaritaville community, the 200,000-square-foot Latitude Landings retail center will open with a Publix grocery store and plenty of shopping space. Almost everything that residents need will be close to home at Latitude Margaritaville. Every aspect of Latitude Margaritaville invites residents to enjoy the outdoors, from the tennis, bocce ball, and pickleball courts to the walking trail surrounded by a tropical landscape. The dazzling outdoor amenities feature a resort-style pool and patio for swimming and lounging through warm Florida afternoons. Walk into the pool with its beach entry feature, lounge under a tiki hut or cabana, or play lawn games for friendly competition with neighbors. Take a seat at the poolside bar for a tropical drink to refresh your relaxation. If the Paradise Pool wasn’t enough, active adults at Latitude Margaritaville will always be near the beach. A continuous shuttle service will breeze residents over to their very own private beachfront club on the sparkling Atlantic Ocean. With such plentiful opportunities for recreation, relaxation, and social activity, residents will never be bored at this Margaritaville location. With Minto's over 40 years of experience developing award-winning communities and building quality homes, 55+ homebuyers can find homes of the highest standard at Latitude Margaritaville. With inventive green living environments and quality designs, you'll enjoy homes that are beautiful and energy efficient at this Margaritaville location. The state-of-the-art new construction homes offered here will have a wide range of styles and options. A total of 15 floor plans allow residents to choose the customizable home model that best suits their active lifestyles. The Caribbean Collection includes six floor plans for attached villas. 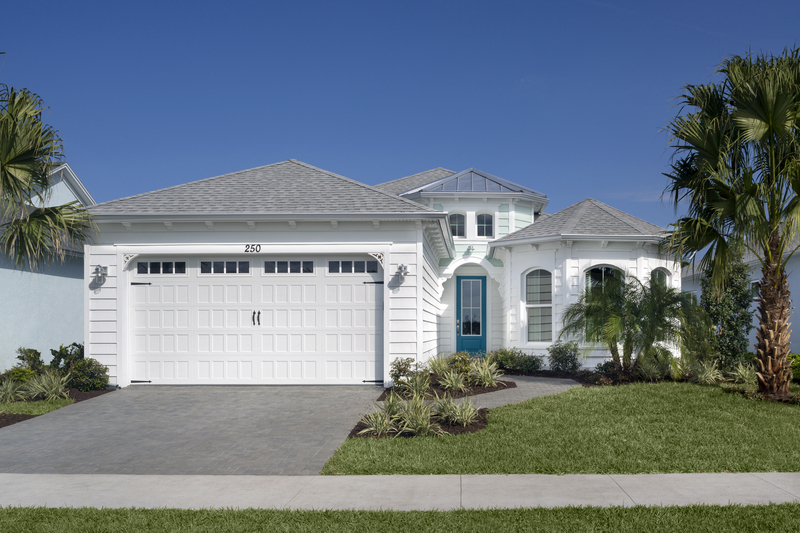 For detached single-family homes, the Beach Collection features five floor plans and the Island Collection features four floor plans. Currently, interested homebuyers can explore nine model homes open on location. For a well-designed interior, Latitude Margaritaville has partnered with furniture company Ethan Allen to present four distinct design packages to help homebuyers achieve the exact style they want. The four themes include Beach House (weathered finishes, seashell tones, and cottage-style furniture), License to Chill (natural textures, warm wood finishes, rustic wood tables, and colorful pillows), Son of a Sailor (warm blue colors, hand-tailored upholstered beds and seats, textural twills, and chic cotton), and In Paradise (white and wood finishes, colorful accent pieces, and seaside cottage styles). It’s clear that Minto has considered every detail when constructing this community, from colorful exteriors to relaxing interiors. 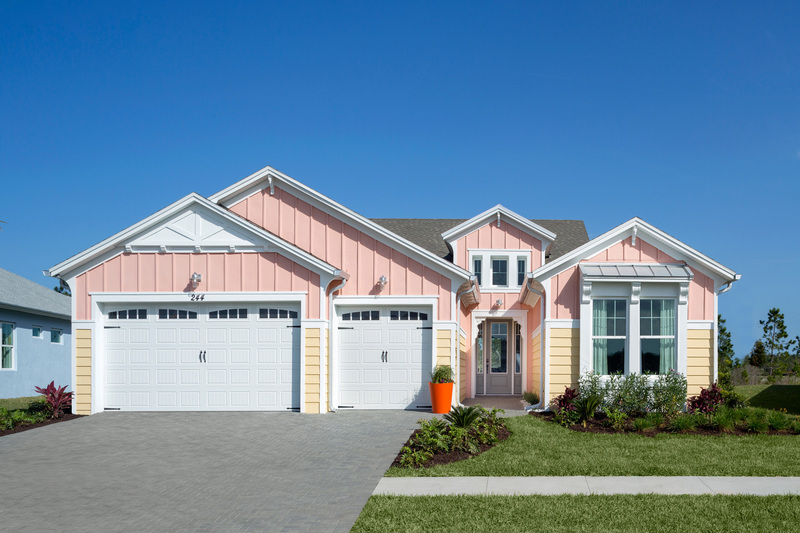 With such innovative floor plans and exciting amenities, Latitude Margaritaville offers some of the best new homes for sale in Daytona Beach, Florida. The Central Atlantic Coast provides endless opportunities for recreation, entertainment, and adventure. With its location in the heart of Daytona Beach, Florida just off of Highway 95, Latitude Margaritaville provides easy access to nearby beaches and championship golf courses. The surrounding area is ripe with opportunities to enjoy a relaxed and exciting active adult lifestyle on the beach for anyone searching for Ormond Beach, FL homes for sale. The Tanger Outlets and The Trails Shopping Center present fun retail opportunities. The Ocean Walk Shoppes & Movies, Riverfront Shops of Daytona Beach, and Ormond Beach Mainstreet are all within reach for an enjoyable afternoon browsing national and local shops. Meanwhile, a 400,000 square-foot “power lifestyle” retail center at Tomoka Town Center, just east of Interstate 95, will be completed soon. Attractions like the famous Daytona International Speedway, Washington Oaks State Gardens, Deland Naval Air Station Museum, and the Ormond Memorial Art Museum surround the community for exciting excursions. And, the Daytona Beach International Airport allows active adults to travel and explore the world—if they ever want to leave their personal paradise. Town Center - Coming Soon! There are plenty of activities available in Latitude Margaritaville. Here is a sample of some of the clubs, activities and classes offered here. The Caribbean Collection boasts six floor plans in sizes ranging from 1,503 to 1,862 square feet in size. These attached homes have two bedrooms, two bathrooms, and attached two-car garages. Most come with a den. 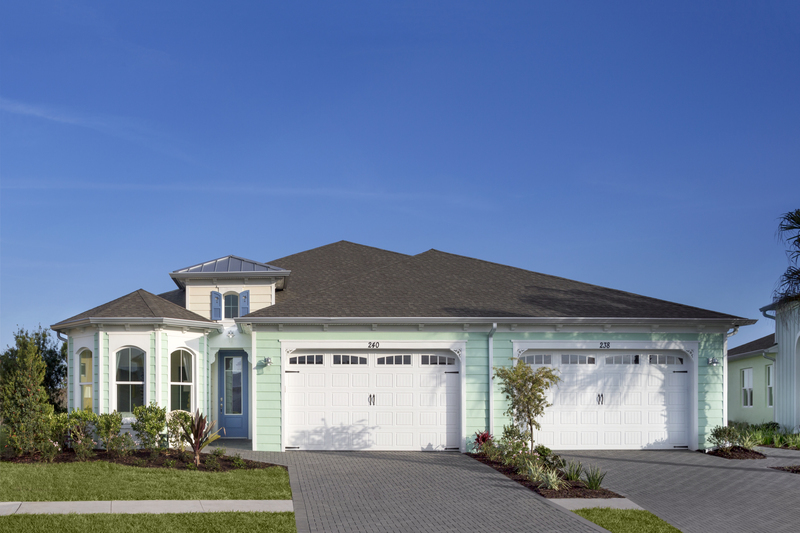 The Beach Collection of single-family homes features five floor plans that range in size from 1,684 to 2,392 square feet. They include two or three bedrooms, two or two-and-a-half bathrooms, and attached two-car garages. All homes in this collection have a den. The Island Collection is the largest collection offered at Latitude Margaritaville. It offers four plans ranging in size from 2,310 to 2,564 square feet. All the plans include a den and come with two or three bedrooms, two-and-a-half to three-and-a-half baths, and attached three-car garages. Awesome! I am a long time Parrothead and visited the models three weeks ago. I was so impressed that I bought a home while visiting from NY. Met my neighbors on FB and can't wait to move in by September. Gorgeous homes, beautiful pool and spa option, and fairly priced. My taxes are a fraction of what they are in NY, plus .... no snow!! FINS UP!!! Looks like fun place to live, but for 55+...prices are HIGH and houses soooooo close together!! Better like your neighbor! We visited this twice last Fall. We're within a year of retirement and have not yet decided whether to leave N.Y or to sell our home and move to a 55 and over co-op community . This place is noisy! We drove around and heard barking dogs, music blasting and other things that someone in their later years is trying to get away from. Also was not happy about living so close to the speedway area, it attracts a lot of rowdies during the year, not to mention the traffic! We still have a new months to make our decision but this seems like nothing more than a gimmick that will not work for the elderly. I don't mind close proximity of houses. Barking dogs, even loud music on occasion. But floor plans are not that good. Houses are too big and expensive for some of us seniors. We are in our 70's, not close to needing assisted living. But we would rather do more fun things than cleaning and maintaining house this big for just the 2 of us. We were hoping for something better than this. Something different from other senior communities. I have ask 3 times for purchasing guidelines for clients but still don't have them. Nothing on the internet and sales center closed on Sat and Sunday. Not good business. While it all sounds good, NOT IMPRESSED. First, everything you see in the models is an option, including a refridgerator! Also, not mentioned, you need to purchase a lot costing from 5K to 25K and up. The lowest price beach model doesn't have a dining room. So to go to the next one up (over 300K) plus options will cost you upwards of 350K. The homes are very close together, so if privacy is a concern, stay away from here. 2. Hours of loud music with a beat sound that actually vibrates in my heart beat. When we visited Margaritaville, there were dogs of all sizes running through the sales office! Then there were even dogs permitted on the shuttle to and again from the models. And the homes are extremely close together which sent warning signals to me, regarding the probable loud music and barking dogs. If you LOVE loud rock concerts and have a dog whose frequent barking is a sound you crave, this is the place for you! There are two things that don't appeal to me about your homes... I am not crazy about your floor plans... most of your floor pans are just variations of the same thing, total cookie cutter. The second and bigger factor for me is: why in a 55 + community, where you most likely don't have kids living at home anymore, do you put the laundry on the opposite end of the house from the master suite?....Put the laundry in the master closet or with access from the master closet to the laundry room... you only have one floor plan that would even come close to allowing you to do that by opening the master bath to the laundry room. That feature alone makes your homes a no go for me... but never fear you are in good company, most retirement communities do the same thing. We were tired of sleepy golfing retirement communities with their earth tone homes in the middle of nowhere. But we gave Latitude Margaritaville a good look! Beautiful floor plans. Great future beach club. Excellent location, with its own culture and festivities. This is so much better for people that want to do more than play weekly bunko. Not impressed. Pretty colors and future plans but unless you want to live on a Carnival cruise ship with roudy neighbors, not an ideal place for active, or upscale living. My husband and I visited the Latitude Margaritaville July 2 and returned again July 5 of this year. We loved the no high pressure sales from the realtors...We visited the models both times and took our time going through them without feeling followed. We were very impressed with this community and are looking forward in 5 years to reside there. We are recommending this community to all our family and friends so they may be interested in being our neighbors. We built our home 20 years ago and already know that upgrades are extra money...We suggest to anyone building to get exactly what you want at the time you are building because it will be cheaper in the long run. We are hoping that they will consider a piece of property and make it a gated storage area for retirees with toys. We just bought into Phase 2!! In reading some of the comments - we called ahead to get an understanding when they would release Phase 2 and got great news! We went down with neighbors who bought in Phase 1 and whose house will break ground in Nov. As we figured out they opened Phase 2 and many of the lots were already taken for the most popular collection - Beach. The town center is well underway. We went well informed (hint:do your homework first you can find a lot of information online if you dig) and discussed things such as options which they said we would see through out all of the models (of course they are putting their best foot forward first with the displays of the models). We wanted to go over numbers for 2 house models so we went through the 2 sets of Attachment As. This 20 or so page doc goes over the content needed by external contractors, wiring, additional 'structural' options, windows etc. This of course adds a bit of $$ so be prepared. Best hint is not to sign right there, leave with the Attachment A in hand, grab a glass of wine or meal and go through it yourself and return with it. We had a good sales associate so we were able to go line by line. Once you sign, you then go through Attachment B (the fun design/decorative options) so be prepared for this $$. But you can walk through all the models and there are informative sheets on everything they put in the that model for reference and to help you in deciding the options. Then at a much later date you go through B. We were told that ground breaking for our new home would also be in Nov with possible key ceremony in May. The LPGA has no membership fee!!!!!! and they do have a great deal with the community for membership. We are looking forward to this new lifestyle and our dog will enjoy Barkaritaville. Oh and Publix will be breaking ground in a month or so. Unlike most other FL retirement comuniities Latitude Margaritaville's homes have a unique "Carribean" vibe in their designs. Exteriors with light, bright, colors and many other touches versus the bland earth tones and similarities you typically find in most of the other "traditional" FL retirement communities houses. All the streets are named after Jimmy Buffet songs or terms. My g/f and I toured the model street with a very informed and professional sales representative Matt and we were impressed. The homes as my g/f put's it are "super cute" and it appears Minto homes has covered all the bases and financial projections. The shared Villas fees are $239.00 which includes all landscaping, yard maintenance, and even yard palm trees and replacements if needed. That also includes all the ammenities including the Ormond beach front area with shuttle service. I might add those fees are expected to rise slightly once the beach front area is open and operational. There are no golf courses on the property which for me is a plus since I am not a golfer and the community won't have to incur the upkeep costs. (The LPGA golf community is very close and Latitude Margaritaville has an arrangement with them for residents while the community center is being built. In conclusion, we were so impressed Latitude Margaritaville we put a lot on hold and will be in contract in the near future. This comiog from someone that lives in The Villages today! We have been to the Visitor Center twice and the models once. We have really tried to make this work for us, but the sales people say they aren't informed enough to help us out. They practically sold 80-90% of the lots in Phase 1, but have NOT opened Phase 2 after 3 months. They are selling homes without any amenities built. How can someone move in, even with reduced HOA, with out the pool, Town Center and especially the Beach Club. ALL other communities we haven visited have built the amenities first so the residents can enjoy them from day one and someone purchasing can see what they are buying. It took several months after sales started to even see the models. I know that Mento is a big developer, but they don't seem to have their act together on this one. If they don't have their contractors and subcontractors lined up, they are going to have a problem building their homes. And what's with having dog parks and pet spas, but not allowing fences?? I know they allow invisible fences, but that doesn't work with a lot of dogs. The fact that they haven't started very many houses and yet they penalize you if you want to have your home finished on a longer schedule. I just don't understand the marketing model that Mento has set up with this. It seems like they can't get enough contractors to build their houses let alone their amenities. That effects quality! What are they thinking??? We are considering ordering a home at Latitude. The models are really sweet, giving wifey lots of ideas. We like the location - near everything Daytona has to offer. And the separate beach and clubhouse will be sweet, giving us that luxury without the hurricane storm surge risk. We can actually buy a new home with a 3 car garage within budget, at a reasonable price, considering the amenities and location. We love the small lots with the big conservation areas. Spending a day doing the lawn is not my idea of fun. And the HOA does all the landscaping, irrigation and yard maintenance, included in what we think is a very reasonable HOA fee, compared to the two homes we presently own. Upgrading to 5 stars. I returned to the Daytona location . They need to get a really good painter in there. The painting on the house is really bad, fire them. Other wise the house would be great, but I won't buy one with that paint job. Very impressed with the model homes and the plans for the community. Went to just check out the area in person but left giving it serious consideration. Regarding comments about the houses being close, that pretty much the norm for new home construction in Florida. The community layout impresses as you do not have many places where you have homes back to back. Overall, we loved it! Flew in from CA to see the property... Had a wonderful RE Agent help us out in getting into the sales center and met with a great sales agent who spent hours with us over 2 days. Got to see the models, even though they were not officially opened yet. Official opening is 2/24/18. It's not for everyone, but if you want to make a FUN change in your later years - check it out! So glad WE did. I went a day before deposits were being taken. I like the concept. What I don't appreciate is that the sales office did not return a call after I asked if I could install a Tesla Solar roof. I think it is a reasonable request. I left a message with an operator but my call was not returned. I will go see the model homes and possibly leave a deposit. I need more assurances that they will communicate with me before I work with them. 55places.com is not affiliated with the developer(s) or homeowners association of Latitude Margaritaville. The information you submit is distributed to a 55places.com Partner Agent, who is a licensed real estate agent. The information regarding Latitude Margaritaville has not been verified or approved by the developer or homeowners association. Please verify all information prior to purchasing. 55places.com is not responsible for any errors regarding the information displayed on this website.